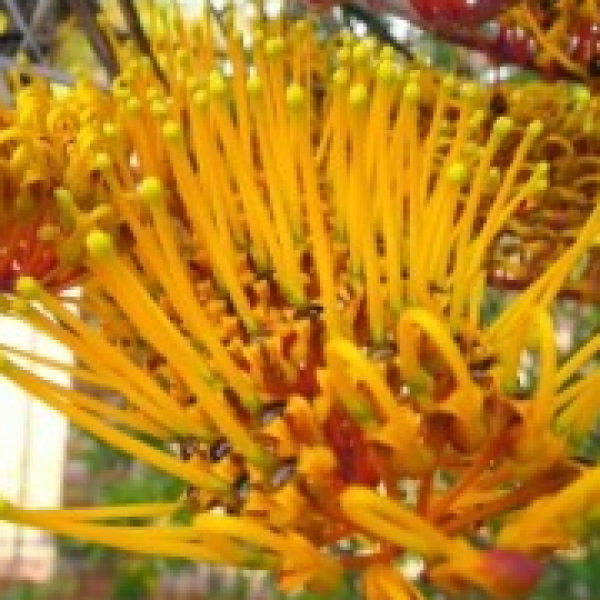 Grevillea robusta, commonly known as the southern silky oak or silky oak, or Australian silver oak, is the largest species in the genus Grevillea of the family Proteaceae. It is not closely related to the true oaks, Quercus. It is a native of eastern coastal Australia, in riverine, subtropical and dry rainforest environments receiving more than 1,000 mm per year of average rainfall. Before the advent of aluminium, Grevillea robusta timber was widely used for external window joinery, as it is resistant to wood rot. It has been used in the manufacture of furniture, cabinetry, and fences. Owing to declining G. robusta populations, felling has been restricted. Recently G. robusta has been used for side and back woods on guitars made by Larrivée and others, because of its tonal and aesthetical qualities.